The latest data from our surveys indicates that around 40% of loan applications for mortgages were rejected in December 2018, compared with 8% a year prior, though on significantly lower absolute volumes. Households often made multiple applications when seeking a loan. 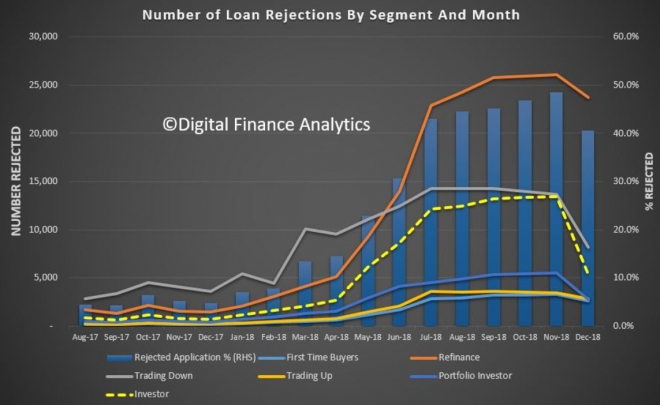 The volume of applications across all segments fell in the lead up to the holidays, and the proportion of rejections fell from 48% the prior month, which was a record. The fall in investor applications is significant, as appetite for investment property eases. The relative volume of refinance applications remained quite high, as people are seeking to reduce their monthly repayments. Non Bank rejections are running a much lower rates than bank rejections. Amazing what happens when prudent lending standards which should have been applied on day one – are finally applied. Too little too late… the damage is done and the carnage is now unfolding. Yes. The damage done to the Australian nation by corrupt practices at our financial institutions and within government is incalculable. The effects of this catastrophe are going to echo through our society for generations. The mad dogs who caused this damage for personal gain are traitors, and deserve the traitors fate. I’d be happy to join the crowd at the hangings and beheadings of the guilty parties, if only we had a reasonable society where such things could occur. If I was one of the 1% I’d be investing in lots of security right about now, because there are going to be a lot of angry and impoverished and desperate people in the future, and they’ll be looking for somebody to blame and vent their anger on. The yellow vests in France are a good pointer to where this is heading. +100. Too little too late. If we had tehse standards from 2008 onwards, we would have entered mild recession and we would have been prospering now. Especially if we also looked after our manufacturing over the last 20 years. Has the market just moved from the Banks to the Non-Banks though ?. People can still get finance albeit at a higher rate which might only make a small dent on personal finances and allow them to hang on. If IR’s went up by anything major though I think this thing would start to belly roll…..
Australia will soon be separated into new classes of haves and have-nots: Those who got a mortgage before mid 2018 and those who will never qualify and never own a home. There’s a very good chance those who qualified before mid 2018 will never own a house either. @Gavin: I hope so, but I don’t see prices dropping much. Those who have negative equity can’t afford to sell at a lower price, and also won’t be able get another new mortgage, so will keep paying their existing mortgage. As the Mortgage slaves in Ireland did before them, didn’t stop prices getting creamed by 50%. Lenders won’t let a home’owner’ sell unless they can repay the loan, no matter how much that ‘owner’ might want to quit. Trapped by debt will be more of a thing, and the more than happens, the lower prices will go, the more ‘owners’ get trapped…. Agreed, and to take it one step further, the debt free peeps in know (i.e. missed the boat post GFC) have freedom of location and are increasingly talking about leaving Aust whether single or with young families. Returned expats are doing everything possible to get out again, the Australia they were nostalgic about no longer exists. Those with less negative equity will try to sell before prices goes down much. Bank cannot say not to sell, just as it cannot say one to buy. Accounting standards will ask bank to report “Fair Value” of the assets and it will be depreciated one way or the other. Prices will go down, so will some jobs. Your case is armageddon Lauri, no less. This whole economy is dependent on HELOC, no different to the US. If people can’t keep refinancing to consume more and the house price growth magic genie disappears, the entire economy grinds to a halt. Car sales, house prices, retail…….it’s happening. We are following the exact trajectory of both the US and Ireland. House prices hit the -10% mark, unemployment and delinquencies skyrocket. We are there now, keep an eye on UE and mortgage delinquencies. I think that we’ve been in separate classes for a decade already. English as a second language? Or just confused. That is complete unadulterated tosh. You could have made the same arguments in the 70s and late 80s. I recall Neil Jenman had a newspaper clip on his website from the early 70s reporting that anyone who wasn’t in possession of a home at that time was locked out forever. Genuine article. Were you a homeowner in the early 70s? I wasn’t even born, what hope did I have? Lauri I could have bought a home any time over the last eight years, it just would have been sh!t and overpriced. Soon I’ll be able to buy a far better one for a lower price, and buy it I will. Which class does that make me? Possibly a privately inheriting sub-class? No I just know how to save. End game, it will fail at any moment now. Why do you say that’s endgame? They got the issue away, aaa rated. What do you think of the pricing? Moody’s put Lehman Brothers’ investment-grade A2 rating “on review” a mere five days before it filed for bankruptcy. Standard & Poor’s gave American International Group (NYSE: AIG) an investment-grade A rating less than a week before the insurance company was nationalized. Merrill Lynch and Bear Stearns sported investment-grade ratings when they were rescued by Bank of America (NYSE: BAC) and JPMorgan Chase (NYSE: JPM), respectively. And both Fannie Mae and Freddie Mac had highly coveted AAA ratings at the time they were forced into conservatorship. Oh, so because it’s rated the issue AAA and confirmed outlook is stable, WBC is about to fall over? Cool. Good story brah! It clearly doesn’t mean it isn’t going to though. The Simpsons and Seinfeld truly were a golden age in tv writing. +1, early Simpsons. Not so sure about Seinfeld though..
Yeah, I never felt the Seinfeld love either. We tried everything to get the loan through but the banks said NO! Final option is to make an appt to see the credit manager, Helen Waite. I thought the manager’s name was Nolan Foryew? Not sure but I think Helen is the State Mgr and Nolan is the Nat’t man who they say has a shrine to St Jude in his cubicle. This guy can set you up with a good deal. We just re-fi’d with BOQ from WBC – simple re-fi of existing loan (no increase, but I actually reduced the repayment term). Dropped from 3.73 no frills (no offset) with WBC to offset etc with BOQ at 3.59. As part of due diligence called CBA and a credit union – advised they couldn’t get the loan to service based on our info (which is weird as we have a large stash of cash and save 10% per month for holidays). I found similar, it wasn’t that much more invasive than before. I’m pretty vanilla in terms of loan structure, deposit, assets and income etc.. as in good credit history and strong financials. However I’m not yet “pre-approved” so we shall see. But I just see this as being prudent on their end. I was hoping for sorry mate rejected! If you can’t get your loan approved you should heed the advice of our former treasurer and get a better paying job. @ J Bauer…Agreed! I’m in that category just turned 46, debt free, just praying like hell I can sell my house and permanently leave Australia, I have had enough of PC / SJW bullsh*t, the hash tag movement and the Sherriff of Nottingham like taxes. There are plenty of countries that offer excellent exemptions for income tax for expats… DYOR! Australia has nothing to offer the middle or low classes, other than a lifetime of debt servitude or a life of misery endlessly renting. So does this include refi or new loans only? Would love to see the split if it was both. The refi rejections will be where the real action is at !